We’re tuning to DADGAD and taking a look at the body-bashing percussive styles of guitarists such as Jon Gomm, Andy Mckee and Newton Faulkner. 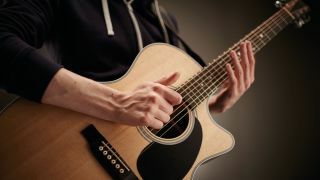 Percussive guitar has gained popularity in recent years thanks to hit albums from Newton Faulkner and the rise of players such as Andy McKee and Jon Gomm online. A mixture of bass notes, melodies and strikes on the acoustic guitar make percussive playing quite a challenge. The idea is to think of your instrument as a drum kit and produce sounds that equate to kick drum, snare and hi-hat by bashing the guitar body. Just take care not to damage your guitar. You have been warned! There are no rules on how to produce these sounds - but keep efficiency of movement at the front of your mind. For our tab examples we’re playing kick and snare hits near the soundhole so your pick hand doesn’t move far; play the hihat with your fret hand. Finally, we recommend plugging your guitar in and using some reverb to enhance the percussive sounds. Use the fleshy part where your hand meets your wrist to produce a low thud like a bass drum. We’re targeting the guitar body above the strings near the soundhole. You need a cutting sound without too much bass for a snare drum vibe. Jon Gomm and Newton Faulkner will often flick the pick guard area with a middle finger. For the full drum kit effect you’ll need to include a sound in the treble range. Pat the strings down against the frets with your fretting hand for a hi-hat vibe. The most basic backbeat rhythm follows a ‘kick snare kicksnare’ pattern, as tabbed here. Count to four to keep time and keep your strikes synched to the numbers. The backbeat is the rhythmic core of music but it's not limited to a basic 'kick snare' pattern. Here we're playing two bass drum hits on beat 3. Here we're adding hihats into the gaps in the previous example. If you get confident with the percussive approach try playing two hits at the same time. Slap the open fifth and sixth strings with the side of your thumb to produce the bass notes here. Leave out the kick drum hit on beat 1 if you can't sync with the notes. Every part here is simple in its own way, but of course you'll be playing three lines at the same time, so you'll need to practise slowly. Obviously you should practise each line on its own; try two parts together as you get the feel for it. Slap the strings with the side of your thumb on the opening D5 chord.